For decades, Hong Kong has been the pivotal gateway connecting China and the world. We are strategically positioned to serve as multiple services platforms for the Belt & Road. Firstly, as one of the world’s leading financial centres and China’s international financial capital, Hong Kong is the platform for capital formation and funding. Hong Kong’s strengths and expertise in financial services need no introduction. Our deep liquidity, premier financial infrastructure and comprehensive options for raising capital, from the traditional IPOs and loan syndication to bonds and the more sophisticated Islamic sukuk, can meet the financing needs of any mega Belt & Road infrastructure project. In terms of IPOs, Hong Kong has been ranked number one globally for five years in the past nine years. We have recently launched a new listing regime that permits the listing of pre-revenue biotech issuers as well as companies from emerging and innovative sectors with weighted voting right structures. This will certainly reinforce our status as a premier capital-formation centre. I am sure many of you here are familiar with the good work being done by the Infrastructure Financing Facilitation Office, or IFFO, under the Hong Kong Monetary Authority. To date, IFFO has attracted more than 80 partners from around the world, including multilateral banks, financiers, pension funds, infrastructure developers and operators, as well as professional services firms, to work together to facilitate collaboration on infrastructure financing and investments. Our Securities & Futures Commission is doing its part as well by setting out eligibility criteria for infrastructure project companies looking to list on our stock exchange. These criteria provide a clear pathway for companies reaching out to Hong Kong for equity and debt financing. Meanwhile, we are also rolling out measures to develop Hong Kong into a hub for bond issuance and green finance. Last month, we launched the Pilot Bond Grant Scheme, offering grants to eligible bond issuers to cover part of their issuance expenses in Hong Kong. We will also provide tax exemptions for interest income and trading profits from qualified debt instruments. The HKSAR Government will soon be issuing green bonds with a borrowing ceiling of about US$13 billion. We will also subsidise the costs issuers incurred in using our Green Finance Certification Scheme launched in January this year. Secondly, Hong Kong is the platform for high-end professional services. Our world-class professionals in engineering, architecture, urban planning, surveying and consulting have the experience and knowledge to lead the Belt & Road projects, in ascertaining project feasibility, in implementing the project and in operating the infrastructure. We know very well that legal, regulatory and political risks can undermine the feasibility of a project, and that risks in construction and cost overruns will negatively impact a project’s profitability. Hong Kong’s deep pool of multicultural talent in law, accounting and finance can help manage these risks, by conducting legal due diligence, structuring the best deal through a combination of financial engineering as well as insurance and reinsurance. What’s more, Hong Kong is the perfect hub for the Belt & Road’s legal matters and for resolving business disputes. Under the unique “one country, two systems” arrangement, Hong Kong remains a common law jurisdiction. The international community is familiar with Hong Kong’s common law system, underpinned by an independent judiciary as well as a very robust intellectual property rights protection regime. Arbitration awards made in Hong Kong are enforceable in over 150 jurisdictions including the Mainland of China. Thirdly, Hong Kong is the platform for you to find the right partners, no matter if it is an equity partner, or a partner for the operation and management of infrastructure. For example, both the Hong Kong Mass Transit Railway Corporation, the operator of Hong Kong’s efficient public railway system, and the Hong Kong Airport Authority, which runs one of the world’s busiest airports, have vast experience in operating infrastructure assets outside Hong Kong. Finally, Hong Kong can be the platform for enterprises to base their offshore operations. With an open and efficient market, the free flow of capital, information and talent, as well as the rule of law and a simple, low and territorial-based system of taxation, Hong Kong has long been regarded as one of the best places in the world to do business. Companies expanding in the economies along the Belt & Road will be exposed to challenges of dealing with currency and interest-rate fluctuations. Hong Kong is an ideal choice for setting up a corporate treasury centre, for centralising a corporation’s financing and liquidity management in the region. We provide tax concessions for corporate treasury centres. Their qualifying profits will be taxed at only 8.25%. At the same time, we will continue to expand our network of free trade agreements, trade promotion and protection agreements, as well as double taxation agreements, in order to better enable such headquarters and corporate treasury centres to be set up here to leverage the extraordinary opportunities in the emerging markets along the Belt & Road. I wish to highlight the exciting prospects for Hong Kong in the Guangdong-Hong Kong-Macao Bay Area development, a national development strategy of China. Linking nine Guangdong cities, together with Macau and Hong Kong, the bay area counts a combined population of 68 million and a collective GDP worth US$1.5 trillion, which is comparable to that of Australia or Korea. In light of the tremendous synergies of Hong Kong and the vibrant tech sector in Shenzhen and advanced manufacturing bases in other cities in the region, we believe the bay area possesses the combined advantages of the New York Bay Area and the San Francisco Bay Area. For our guests coming from overseas, I would strongly recommend you to spend time to uncover the tremendous potential that the bay area development may bring to you. Financial Secretary Paul Chan gave this speech at the Luncheon Plenary of the Belt & Road Summit on June 28. The Belt & Road Initiative is giving us a long-term promise of transnational and intercontinental connectivity and will give rise to rewarding business prospects. They will take different permutations and shapes, including new air, sea and land routes, additional ports, rails and roads connecting isolated regions, economic and trade pacts, and increased investment flow. Hong Kong, being the world’s freest economy and China’s most international city, is destined to play a significant role in the Belt & Road Initiative. Last December, I signed on behalf of the Hong Kong Special Administrative Region an arrangement with the National Development & Reform Commission for advancing Hong Kong’s full participation in and contribution to the Belt & Road Initiative. The arrangement covers six key areas ranging from finance and investment to people-to-people bonds. An annual Joint Conference mechanism was also agreed upon. The conference gives Hong Kong a unique and direct dialogue with central authorities regarding the Belt & Road Initiative and our participation in it. I’m pleased to say that the first meeting of the Joint Conference was held in Beijing just over two weeks ago. While the details are being worked out, I can tell you that Hong Kong will contribute to the initiative across all areas of its wide-ranging connectivity, from policy coordination, financial integration and trade, to infrastructure and people-to-people bonds. Hong Kong’s singular most important advantage in playing an active role in the Belt & Road Initiative is, of course, the “one country, two systems” framework that has propelled our development in the past 21 years. It allows us to expand our traditional strengths as an international financial, trade and logistics centre, while deepening our economic integration with the Mainland. An international financial centre, and one of the world’s great trading economies, Hong Kong has long served as a regional hub and a business bridge connecting the Mainland, Asia and the rest of the world. We also embrace the free flow of capital, of goods, information and talent. 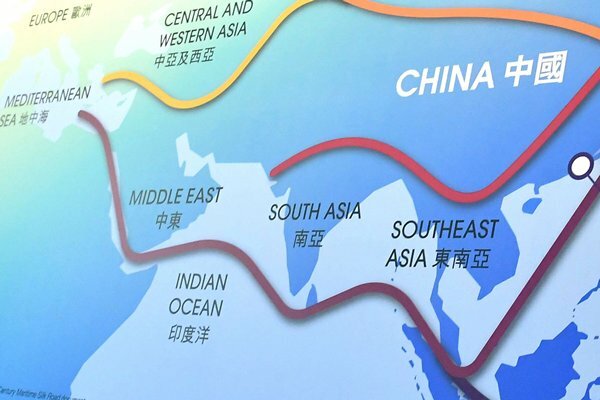 That fluid connectivity will prove indispensable long down the Belt & Road, a point driven home at a seminar held at the Great Hall of the People in Beijing in February this year, the theme of which is “Strategies & Opportunities under the Belt & Road Initiative – Leveraging Hong Kong’s Advantages, Meeting the Country’s Needs”. Some 380 chief executives and senior management from more than 170 state-owned enterprises took part, along with four state leaders and 80 other central officials. Such an impressive turnout would not have been possible without the strong support of Chairman Xiao Yaqing of the State-owned Assets Supervision & Administration Commission of the State Council. I am extremely grateful to Chairman Xiao for taking time out of his busy schedule to attend the summit today, along with his colleagues, Vice Chairman Ning from the National Development & Reform Commission and Vice Minister Gao from the Ministry of Commerce. Capital formation will be critical to that role. With liquid capital flow and a deep pool of global financial talent, Hong Kong is the natural centre from which to raise funds for infrastructure, investment and production projects. We are also ideally suited to provide the risk management, insurance and dispute-resolution services that Belt & Road partners and their projects may need. Similarly, I envision an increasing role for Hong Kong as a fundraising hub for green projects, particularly in promoting sustainable Belt & Road development. Earlier this year, my Government announced a three-year Pilot Bond Grant Scheme. I’m confident it will encourage more Belt & Road investors and issuers to participate in the Hong Kong bond market. A Hong Kong Government green bond issuance programme – with a borrowing ceiling of US$13 billion (HK$100 billion) – is also in the pipeline. It will support green projects under the Government’s public works programme. We believe the programme will help provide benchmark pricing and stimulate market development. In addition, the Hong Kong Quality Assurance Agency launched its Green Finance Certification Scheme in January this year. The programme provides third-party conformity assessments for issuers of green bond instruments. Eligible green bond issuers using the scheme will be subsidised, with a view to supporting green development financing. In short, I believe green finance can only expand our financial diversity and formidable international standing. The Hong Kong Stock Exchange, to take one example, has been ranked among the top five, globally, in initial public offerings for the past eight years. Last year, funds raised through IPOs amounted to US$16.5 billion. In April last year, our Securities & Futures Commission set out eligibility criteria for infrastructure project companies looking to list on our stock exchange. The criteria provide a clear pathway for Belt & Road projects and companies looking to Hong Kong for equity and debt financing. Hong Kong is the world’s largest offshore renminbi centre, handling about 76% of offshore renminbi transactions. We are, as well, the leading centre for offshore renminbi asset management. Importers and exporters in Belt & Road countries can settle their trade in renminbi through our payment system, good at more than 200 banks from all over the world. And investors can tap our renminbi liquidity through bank loans or “dim sum” bond issuance. They can also invest their surplus renminbi liquidity in a wide range of renminbi products, all available right here in Hong Kong. More than a financial capital, Hong Kong is the region’s logistical and transport hub. Hong Kong International Airport is the world’s busiest airport for international cargo. And we are determined to expand on that hub role, with construction of a three-runway system for the airport continuing. On completion, the new airport will have the capacity to handle 100 million passengers and nine million tonnes of cargo a year, compared to 70 million passengers and five million tonnes of cargo last year. To strengthen our air cargo hub position, earlier this month, the Hong Kong Airport Authority announced the granting of rights to develop a major logistics centre of 380,000 sq m GFA (gross floor area) at the airport. Our land connectivity is also developing at an extraordinary rate. And the flow of people and trade, and opportunity between Hong Kong and the Mainland is about to soar, thanks to the opening, later this year, of the 42 km Hong Kong-Zhuhai-Macao Bridge and the 26 km Hong Kong section of the Guangdong-Shenzhen-Hong Kong high-speed rail. Each, in its own way, will slash travelling time between Hong Kong and the Mainland. Together, they will surely fast-track development of the Guangdong-Hong Kong-Macau Bay Area. The bay area, another major national development priority, will serve as a powerful connection point for the Belt & Road. A cluster of nine flourishing cities in Guangdong province together with Hong Kong and Macau, the bay area unites a collective population of over 68 million and a combined GDP of some US$1.5 trillion, which is comparable to Australia’s GDP. Taking advantage of the varying expertise that abounds in the 11 cities, the bay area is expected to rise as a global centre for finance, high-end services and innovation and technology. In doing so, it will also boost interaction and integration within the region, encouraging strategic partnerships between Hong Kong, Guangdong and the larger Belt & Road region. Beyond all that promising business and investment, the “Silk Road spirit” will also thrive, with its emphasis on the promotion of community and people-to-people bonds. In this regard, Hong Kong, Asia’s world city, has much to offer. Culture, of course, will be central to this. But we will also be pleased to share our experience and knowledge in other areas as well, including corruption prevention, dispute resolution, city management involving firefighting, flood prevention, slope stabilisation as well as aviation safety, railway operations and more. The Hong Kong International Aviation Academy, for example, is now forging closer ties with ASEAN countries. Sponsorships are being offered to students from Cambodia, Laos, Myanmar, the Philippines, Thailand and Vietnam to help develop expertise in regional air transport management. Our Independent Commission Against Corruption has been sharing its long experience in fighting corruption with regions and countries along the Belt & Road. And my Government is committed to expanding educational cooperation and exchanges with Belt & Road countries. We have already launched a Hong Kong scholarship for Belt & Road students. It supports outstanding students from Indonesia, Malaysia and Thailand, helping them pursue undergraduate studies here in Hong Kong. We have also introduced a new subsidy scheme to encourage students in Hong Kong to participate in the Belt & Road region exchange programmes. 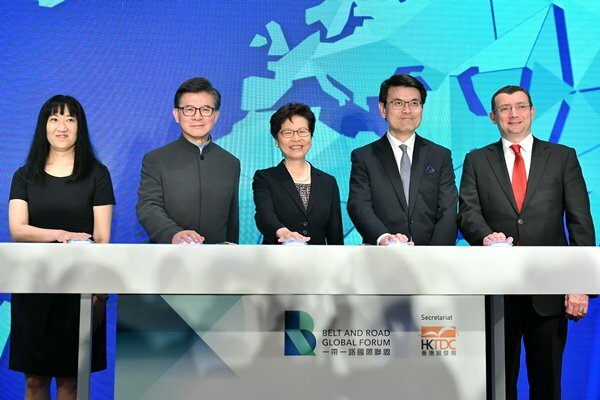 The Hong Kong Government, in short, is committed to being both a “facilitator” and a “promoter” of the Belt & Road – today, tomorrow and long down that road of transformative connections and boundless opportunities. Chief Executive Carrie Lam gave these remarks at the Belt & Road Summit on June 28. During my almost two weeks’ travel in Europe covering Brussels and several cities in France, this Belt & Road Initiative popped up very often, whether amongst very senior government officials, especially in France, because when President Macron visited Beijing earlier this year, he came back and announced that France would like to take a leading role in the Belt & Road Initiative, and hence, the Prime Minister of France was in China only a few days ago. This picking up of momentum on the Belt & Road almost five years after President Xi Jinping announced the initiative is to be very much welcomed, and of course welcomed by Hong Kong because the Central Government has made it very clear that Hong Kong will have a major role to play in the Belt & Road, and also to contribute to make the Belt & Road a success. That’s the objective of our signing an arrangement, very exceptionally, with the National Development & Reform Commission last December. I just want to say that our work in Belt & Road has been picking up momentum and I’m very pleased with the achievements following the signing of the arrangement last December. The inaugural meeting for us to meet with relevant authorities and agencies in the Central Government spearheaded by the National Development & Reform Commission took place earlier this month. This is a very important forum for us to have first-hand information about the Belt & Road, including things which are of great interest to many of you – the projects, the policies, the financing and so on. In this particular forum, we are extremely pleased, being the third one in a row, we have attracted over 5,000 participants. And this forum has now been given added meaning and strength with the formation of the Belt & Road Global Forum, which has within a very short period, not only set up but attracted some 111 member associations from 29 countries. I have to congratulate and commend the Trade Development Council, in its usual can-do spirit and efficiency, for getting this global forum up and running and I’d love to meet with you in future occasions to talk about our joint efforts in the Belt & Road. Meanwhile, enjoy this reception and the full day of programme tomorrow at the third Belt & Road Summit. Chief Executive Carrie Lam gave these remarks at the Belt & Road Global Forum Inauguration Ceremony & Cocktail Reception on June 27. It is my pleasure to join you today, witnessing another breakthrough application of fintech in Hong Kong: using blockchain technology for cross-border remittances. While this application would be a pilot at first, allowing Alipay users in Hong Kong to send money to the Philippines, it will in the long run offer a more efficient and cost-effective way of transferring money around the world. 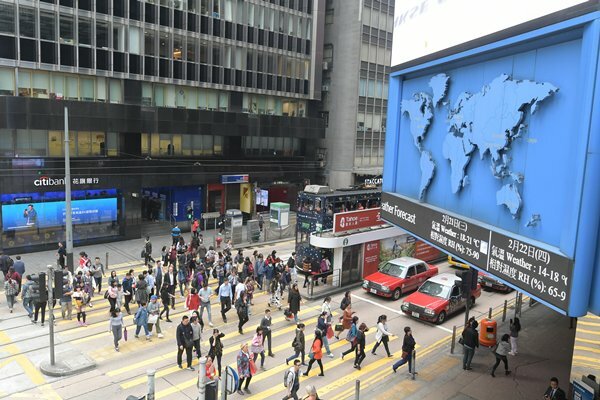 Hong Kong is the international financial centre in Asia and it is most fitting that Ant Financial has chosen to kick off this pilot project right here. While we take pride in Hong Kong’s robust and effective financial regulatory regime that is well in line with international standards, our financial regulators are doing their part to facilitate and foster innovations in the industry. With their dedicated liaison platforms and sandboxes, our financial regulators are allowing financial services providers to conduct pilot trials on fintech solutions in a confined environment. For instance, the Fintech Supervisory Sandbox of the Hong Kong Monetary Authority (HKMA) is well loved, and well used by banks. Through the Sandbox, banks and partnering fintech firms are able to gather real-life data and user feedback on their new fintech-driven solutions more easily, so that they can make refinements to their proposed solutions as appropriate before full market launch. In just two years’ time, 22 new technology products and services have been tested in HKMA’s sandbox and have been rolled out to the market. I am glad to see that fintech is bringing greater convenience to the public as witnessed in the e-wallet market over the past few years. It all began in 2015 when the Payment Systems & Stored Value Facilities Ordinance came into operation which provided a clear and certain licensing and regulatory framework for stored value facilities (SVFs). With clarity and certainty in regulation, SVF licensees commenced their safe and sound operation and have now developed a secure, efficient and diversified electronic payment industry laying a solid and strong foundation for the development of the e-wallet market. Alipay Hong Kong certainly played a key role in the course as it is one of the first SVF licensees in Hong Kong. Healthy competition amongst strong SVF operators has led to innovations and new services such as electronic coupons, family group e-wallet management, online shopping, insurance and QR code payment, all to the benefit of the general public. It is therefore not surprising that the number of SVF accounts in use has jumped by 15.4% in just a year’s time to 46.7 million by end-2017 while the value of transactions increased by 27.7% to over $38 billion. More exciting developments in Hong Kong are in the pipeline, with the launch of the Faster Payment System (FPS) in September this year. This new financial infrastructure will provide full connectivity between banks, SVF operators, merchants and consumers. Participating banks and SVF operators can provide real-time credit transfer and real-time direct debit services to facilitate payments between merchants and customers, as well as peer-to-peer transfers through the FPS platform. The HKMA is also working with the industry to explore how to enable merchants to use a single QR code for accepting mobile payments from different SVF operators. This is conducive to a wider adoption of QR code payment in Hong Kong and will enhance user experience. An exciting new era of fintech awaits. The Hong Kong Special Administrative Region Government will continue to do its best as a promoter and facilitator for fintech companies in Hong Kong to grow and prosper. Financial Secretary Paul Chan gave these remarks at the “Miles apart but close at Heart – Innovative Blockchain-based Remittance Solution to Enhance Financial Inclusion” press conference on June 25. When I said Hong Kong does have this advantage for innovation and technology. One is we are a very free and competitive economy. In fact, we are the world’s freest economy, as ranked by the US-based Heritage Foundation for 24 years in a row. We’re also among the world’s most competitive economies. In the recent report published by the Swiss-based Institute for Management Development, we came second after the United States of America. And all the freedoms and rights of the Hong Kong people, as well as expatriates working in Hong Kong, are enshrined in the Basic Law, which is a constitutional document governing Hong Kong, because after 1997 Hong Kong is governed under “one country, two systems”. To do I&T, or to do business in general, you need to have a very stable environment where there is certainty. Hong Kong prides herself on the rule of law. We have a very robust intellectual property protection regime. We are business-friendly. We practise a very simple tax system and (have) very low taxes. For profits tax, the flat rate is 16.5%, and recently my Government has introduced a tax concession to halve the 16.5% to 8.25% for the first HK$2 million profits for every company – HK$2 million will be roughly 225,000 Euros. This should be very attractive for small and medium enterprises including startups. And we run a very efficient and clean government. We have the people that are needed to develop I&T because four of our universities are among the world’s 100. So in terms of city, we are perhaps the city with the most intensive concentration of distinguished universities, and they are very good at research as well. At the same time, we have very professional and competent professional services in legal, finance, corporate, accounting, and engineering. For those of you who have visited Hong Kong, you will feel very at home, because we are a very international, cosmopolitan society. English is widely spoken in Hong Kong – it’s one of the two official languages. People also speak Mandarin, in addition to Cantonese, which is the local dialect. And we are one of the safest cities in the world. In fact, the total crime rate per 100,000 population now in Hong Kong, which only stands at 758, is the lowest since 1971, so this is a city you will feel very safe in. Even if you are walking at night by yourself or even if you are a lady, you should feel very safe. We are a liveable city, very walkable. You don’t even need to drive in the city of Hong Kong. Over 90% of the daily passenger trips are looked after by public transport – about half by the Mass Transit Railway Corporation. And we are a very green city, only 24% of the land has been developed and 40% has been preserved for the people and tourists to enjoy, it’s what we call country parks. France is very good with food and beverage. We are also very good with cuisine, in fact we have over 11,000 licensed restaurants in Hong Kong. I think many of them are offering very good French cuisine, but of course when it comes to wine we have to import from Bordeaux, and maybe Burgundy. Hong Kong is very convenient. Our international airport is the world’s number one in terms of cargo and number three in terms of passengers, receiving over 17 million passengers every year. You can fly from our international airport to 220 destinations all over the world, and in fact half the population could be reached within a flight of about five hours. As I just mentioned, constitutionally we are “one country, two systems”. We are part of this growing nation, the world’s second largest economy – the People’s Republic of China – but after 1997, when we had been reunited with the Mainland of China, we maintained our own system, that’s where the “two systems” come in. We have our own legal system which is premised on the common law jurisdiction, we have our own currency, which is the Hong Kong dollar, we have our own monetary system, financial system and so on. But, as China is growing in terms of economic importance, President Xi Jinping, said in his recent National Congress Report that the Central Government would support Hong Kong to integrate more fully into the Mainland’s development. Hong Kong’s advantage also lies in being the gateway to China. In other words, people and businesses that want to do business and invest in China, the best place to start is Hong Kong. On the one hand, we are very close to China’s big market of 1.3 billion population, and we have four decades of experience working with Mainland China, because this year, 2018, is the 40th anniversary of the opening up of China’s economy in 1978, and since then Hong Kong businesses and professional service providers have been going into the Mainland market to provide services to invest, to open factories and so on. So, we are an expert in accessing the Chinese market. And it is to be borne in mind that while China is still categorised as a developing country, the middle class is growing. When the middle class is growing, the demands for quality goods and services will rise, including a lot of affluent goods and wine from France, and also high quality services including medical services and engineering services that this country has to offer, particularly in the area of the AI industry, because part of my trip coming over here is to learn more about the French technology, artificial intelligence and health technology. We are forecasting that this domestic artificial intelligence industry will grow significantly in the coming years. To become the gateway to China, we also need very strong national support. I’m pleased to say in my capacity as the Chief Executive now, who has direct access to the leaders, including President Xi himself, it is very obvious to me that the Central People’s Government wants to support Hong Kong, wants Hong Kong to succeed under “one country, two systems”, and maintain her own way of doing business, of living and so on, particularly in two major initiatives of the nation. One is the Belt & Road Initiative. The Central Government will support us to play an active part in the country’s Belt & Road Initiative, which actually reaches three continents. The other initiative is closer at home, it’s the Guangdong-Hong Kong-Macao Bay Area. The Belt & Road Initiative was announced by President Xi Jinping about five years ago. It is an initiative trying to connect with many countries and economies along two passageways. One is the Maritime Silk Road, one is the land-based economic silk belt. These two routes cover over 60 countries in three continents of Asia, Africa and Europe. There will be a lot of demand for infrastructure, financial services, and professional services arising from the Belt & Road region, with projects either financed by China or by other enterprises, and that’s why it will bring a lot of opportunities to economies which are very good at providing some of this services support. This Belt & Road covers 62% of the world’s population. At the moment it’s about only 31% of the global GDP but it is destined to grow. I am sure you have heard about the growth of India, the rising importance of the ASEAN region, the Southeast Asian nations of Thailand, Vietnam and so on. The other initiative is in the southern part of China. There is a big province called the Guangdong Province, which is next door to Hong Kong, and the national strategy is to develop this area, the nine affluent cities in Guangdong plus Hong Kong and Macau, two Special Administrative Regions, into a bay area type of economy. You can describe it as a city cluster, but we tend to prefer calling it a bay area economy as per the San Francisco Bay Area, the Tokyo Bay Area and the New York Metropolitan Area. And this bay area has a population of 68 million people, a GDP of US$1.5 trillion, which is about the size of Australia, and it is still growing, as I mentioned about the middle-class growth in the Mainland of China. Together we want to have a free flow of people, goods, services, finance and capital within the bay area. So hopefully through some supportive policy measures, there will be very little barriers in accessing this particular part of the Mainland of China in terms of goods and services. And particularly relevant to this afternoon’s topic is technology. One of the highlights in the bay area is to develop a world-class, global I&T hub very much like the Silicon Valley in San Francisco Bay Area, because we are seeing a lot of potential for going into this area. Why do I feel that we have that potential for contributing to a world-class I&T hub in the bay area? One is Hong Kong has world-class information infrastructure. At the moment we already have 11 submarine cable systems in Hong Kong. We have very strong data centre clusters, still building these high-tier data centres in an industrial area called Tseung Kwan O, and Google has just recently opened a Google Cloud platform in Hong Kong. Second is we have a thriving technology ecosystem and this ecosystem grows very rapidly once it has found its niche. Amongst the world’s startup ecosystems, Hong Kong is one of the fastest. I’m sure France is the other. I went to see Station F, this year with 3,000 people working in startups in this project. And over the last three years, we really have seen the number of startups booming and growing in Hong Kong, that now we have over 2,200 startups. Some are staying in the facilities that the Government is providing. Startups will need venture capital. The provision of venture capital by the private sector has been growing and the Government is also chipping in the government money to provide venture capital. We are very pleased to see that in our own I&T nurturing, we have already grown three unicorns in artificial intelligence, in courier services and so on. And this very famous drone is also conceived by researchers in Hong Kong but then produced in Shenzhen called DJI. It is now becoming a very valuable asset. The third factor is we have the infrastructure, because startups need a place to work and researchers also need their facilities. At the moment, we have two flagship facilities in I&T, one is the Science Park under the Science & Technology Parks Corporation, the other is the Cyberport. There’s a little bit of division of labour between the two. Cyberport is more focused on fintech whereas Science Park provides space for a lot of technology areas. And we are not stopping at this stage. Right now we are still expanding the Science Park and among the expansion is a building which is called InnoCell, because I appreciate, I just said at the beginning, property prices are very high in Hong Kong, both for researchers and scientists to come to Hong Kong to work with us. Finding a place to stay is a major problem. So, with this InnoCell on-site we’ll be providing 500 units for researchers so they can live and work in the Science Park. And looking ahead, we already have plans to develop an 87-hectare second science park in Hong Kong in an area which is very close to Shenzhen called the Lok Ma Chau Loop – 87 hectares, able to build about 1.2 million square metres of gross floor area, which is about four times bigger than the first Science Park that I have just shown you. This will provide more space and land for technology companies to work from. We are starting to do construction work on this second Science Park. And by the way, it is branded as a Hong Kong-Shenzhen park because we will work very closely with the city of Shenzhen, which I’m sure you know now accommodates a large number of tech companies like Tencent, Huawei and so on. We expect to deliver the first plot of land in 2021 for these technology centres and laboratories to be built on it. Since I took office on the 1st of July last year, in a few months’ time I and my team, including Nicholas Yang, have met with a lot of tech people, whether it is Jack Ma of Alibaba, Pony Ma of Tencent and all these venture capital companies. And as a result of those interactions, I’ve come up with an eight-pronged strategy to grow Hong Kong’s I&T. I will just briefly take you through these eight areas. One is talent. And I’m sure we have talents in the audience. We need more talents, local talents and overseas talents, to join us in this very ambitious policy drive. We have a Technology Talent Scheme that provides funding for postdoctoral positions. Some of these are actually in enterprises. So when enterprises take on a postdoctoral candidate, we actually pay for that postdoctoral position. That will make it easier for the private enterprises, especially the smaller enterprises, to be able to nurture and retain these talents. And we have a Postgraduate Research Studentship Programme of HK$3 billion that we will pay for postgraduate students doing research in our local universities. There’s also a Technology Internship Programme arranged by Science Park and Cyberport. And very recently, we’ve introduced a Technology Talent Admission Scheme, that is an immigration scheme that will give easier access and much faster processing time for tech talents. So tech companies will apply and be given a quota, and with that quota, they can recruit worldwide and once they recruit and use their quota then our immigration authority will issue the work visa for these tech talents, so it’s a very fast-tracked arrangement. I just mentioned we also put in our own money to invest in promising startups, so we have a HK$2 billion Venture Fund for that purpose and we are working with private sector venture capital on a matching basis. On infrastructure, I’ve already mentioned about the second Science Park we are building. The third strategy is to open up government data so that researchers have easier direct access to the huge amount of data that the Government is keeping, whether it’s on education, on medical, on transport, so that it will provide the energy and the necessary input for research to be undertaken by research companies and startups. Popular science education is very important for any place that aspires to become a technology hub. So apart from supporting our universities to do more research and development to have more international collaboration – just like this morning, I witnessed the signing of an MOU between Hong Kong University medical school and Institut Pasteur here on biomedical technology and research co-operation – we have also to do more on popular science so that young kids will start to pick up greater interest in STEM – science, technology, mathematics and engineering. Upgrading the Science Museum, making it more interesting for kids to visit, is also one of the initiatives that we have announced. I know that as we move on to the I&T field, some of the legal provisions that are in place may not be able to catch up with this new requirement, so I have an exercise to review the legislation and regulations in Hong Kong to see whether certain provisions are outdated and others are obstructing the development of technology and need to be revisited. Government is a major procurer of goods and services. For example, the Government budget accounts for 21% of the GDP. So we can lead by example by injecting more I&T into the way we buy things or we buy services. Another review is going on to change the government procurement rules to give more, I wouldn’t say favouritism, but to give a bit more weighting to I&T in getting the government tenders to provide goods and services. Research funding is very important and they tend to be rather expensive because to have successful R&D takes time and they have to be on a sustainable basis. So we already have an ITF, Innovation & Technology Fund, that provides the long-term funding to some research projects. Lately we gave this fund another HK$10 billion so that it will have more than enough for the time being to fund these R&D propositions. I have set for my Government a very ambitious target – that is within my term, up to 2022, we want to double the R&D expenditure in Hong Kong, both public and private sectors taken together, from the current 0.7% of GDP to 1.5%. That is equivalent to about HK$45 billion every year on R&D spending. This is actually not bad although people will compare us to places like South Korea, which is 4%, or Singapore, which is 2 to 3%. But you have to appreciate that in Hong Kong, we don’t have any defence R&D because foreign diplomacy and security defence are matters for the Central Government, so we don’t really need to go into that area of defence research. Apart from the eight-pronged strategy, in this particular area of research spending, we cannot do it on our own because it will be too much for the Government to shoulder all the R&D spending, and after all it will not be very healthy for the Government to be the only major provider of funding for R&D. So we have a three-pronged approach in this particular area. One is public investment. We will give more to the Innovation Technology Fund for people to apply. We will give more to the universities under the RGC (Research Grants Council). Secondly, we will incentivise the private corporations to spend more on R&D, and the best way to incentivise corporations is through tax relief measures. How do we do it? We are providing for the first time in Hong Kong’s very simple tax regime something called super tax deduction. For simple illustration, a company that spends HK$100 million on qualified research areas in terms of assessing profits tax liability, we will give them two times or three times relief. The current two-tier system is that the first HK$2 million R&D will attract a 300% tax deduction. Anything above HK$2 million will attract 200% tax deduction. And the beauty of our tax concession is we do not impose any limit. You can spend as much as you like and still enjoy this major tax deduction. The third way to increase R&D expenditure in Hong Kong is of course to attract companies and laboratories to Hong Kong, and their R&D expenditure will become Hong Kong’s R&D expenditure. So we have a plan to create R&D clusters in two particular areas – one is health technology, the other is artificial intelligence and robotics. Apart from these two areas which we will build a cluster, we are already quite strong in fintech because Hong Kong is a financial services centre and we already have the Cyberport providing the necessary support and incubation for fintech. And I know proptech is actually a sub-sector of fintech so we welcome any proptech startups to consider working with us at the Cyberport. The fourth area is smart city. Many of the cities aspire to become smart cities. This is not an easy target, but I would say that we are working through a blueprint in smart city. The reason why we chose AI and health is because we feel that we are strong in those areas with our research capability, and by inviting overseas institutions to come to us, we will be able to kick-start this area much faster. And that’s why in this trip to France I went to visit the Ecole Polytechnique and the Sorbonne University to explore opportunities for them to consider working with our universities in this particular cluster of bio-health technology as well as AI and robotics. We are putting in another HK$10 billion to support these two clusters in Hong Kong. The Smart City Blueprint in Hong Kong was announced last December. I truly believe that in our Smart City Blueprint there should be plenty of opportunities for application of technology in property and real estate management. 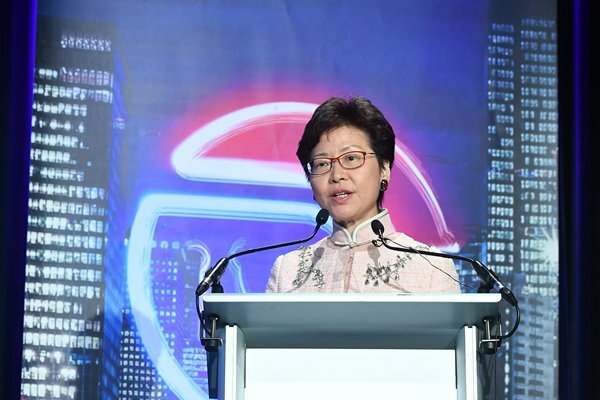 Chief Executive Carrie Lam gave these remarks at the MIPIM Proptech Europe 2018 forum in Paris on June 21. The concept of the Bay Area emerged from very important statements made by the leaders in the last couple of years. In the 13th Five-Year Plan for the Economic & Social Development of the People’s Republic of China, it was made very clear that the Central Government will support the joint efforts by Guangdong, Hong Kong and Macau to build a quality living area in the Greater Pearl River Delta region and accelerate the development of several areas within this bay area, which have been given special status in terms of being a free port – they are Qianhai, Nansha and Hengqin. They will become the platforms for co-operation between Guangdong, Hong Kong and Macau. The Central Government will encourage Hong Kong and Macau to play an important part in the Pan-Pearl River Delta Region co-operation and the development of this Guangdong-Hong Kong-Macao Bay Area. Then further on, when Premier Li Keqiang delivered his annual work report in March last year, he said: “We will promote closer co-operation between the Mainland and Hong Kong and Macau. We will draw up a plan for the development of a city cluster in the Guangdong-Hong Kong-Macao Bay Area, give full play to the distinctive strengths of Hong Kong and Macau, and elevate their positions and roles in China’s economic development and opening up”. Just to give you a feel of the major city clusters in the world, we generally refer to, apart from of course the Guangdong-Hong Kong-Macao Bay Area, the San Francisco Bay Area in America, the New York Metropolitan Area, also in the US, and the Tokyo Bay Area. In so far as in China, there are also city cluster developments – because now the world is highly competitive, we need to look for co-operation and synergy among cities in order to raise the competitiveness of the economic region. So, apart from the Guangdong-Hong Kong-Macao Bay Area, which I would say is a latecomer – we are emerging in the last couple of years – we have the Yangtze River Delta which comprises the very affluent city of Shanghai and the adjacent provinces, and the Jingjinji Metropolitan Region which comprises Beijing, Tianjin and Hebei Province. Coming back to the bay area, it consists of nine most affluent cities in Guangdong Province and the two SARs of Hong Kong and Macau. Now some of the basic facts about this particular bay area – the land mass is 56,000km, many times bigger than Hong Kong which has only 1,100 sq km. In terms of population, it is quite large: 68 million is about the size of the UK. In terms of GDP, it is US$1.5 trillion, which is roughly the size of Australia or South Korea. Of course Macau has the highest GDP per capita in this region because of its smaller population and it’s doing very well in the gaming business. We are not bad – we are number two with per capita GDP of US$46,200. But since in general, China is still a developing country, and that is the beauty of this bay area, it still has a lot of energy to grow. The GDP per capita of the entire region is about US$21,760. This area is characterised by very good connectivity with the rest of the world, as illustrated by the number of airports and the number of ports in this region. In terms of Hong Kong, we are the world’s number one in terms of air cargo, making the mark of five million tonnes of air cargo last year, which was very remarkable. In terms of the port, we used to be number one, but we have come down a bit. We are now the world’s number five. But within this bay area we have the Shenzhen port, which is up and coming. We have the Guangzhou Nansha port, which is also growing. So the port business and the airport traffic within this region are really very active and booming. How do we compare with the other bay areas that I have just shown you on the map? In terms of population, we are the largest, which means that we have huge potential because people drive productivity and growth. In terms of GDP, we are growing. I am very confident that we will catch up the other bay areas pretty soon, because the difference is actually quite narrow now. We have very strong air traffic, as I have just described, and in terms of the port and air passenger travel, this is really a very important area in the world. (There) are favourable conditions for French businesses and overseas businesses to work with us in this bay area. Favourable condition number one is the national significance and the mandate given to us by the leaders. So let me take you through a few of these statements. In his 19th CPC National Congress report, General Secretary and President Xi Jinping said the Central Government will continue to support Hong Kong and Macau in integrating their own development into the overall development of the country. And priority will be given to the development of the Guangdong-Hong Kong-Macao Bay Area and the regional co-operation in the Pan-Pearl River Delta. And then in Premier Li Keqiang’s report earlier this year (he) has this to say: “We will unveil and implement the development plan for the Guangdong-Hong Kong-Macao Bay Area, and promote in all areas mutually beneficial co-operation between the Mainland, Hong Kong and Macau”, which implies the development plan is more or less ready and will shortly be announced. Another very important milestone in the bay area took place on the 1st of July last year. That is the day when I took office and when President Xi was in Hong Kong to supervise the inauguration ceremony. We signed, in the presence of President Xi, a very important framework agreement on deepening cooperation in the Guangdong-Hong Kong-Macao Bay Area. As you can see, there were four parties signing this framework agreement. They represented the three governments – Guangdong, Hong Kong, Macau – and the Chairman of the National Development and Reform Commission, because it is about integrating not only within the bay area but into the national development. That’s why the National Development & Reform Commission plays a very key role in the bay area development. A development plan shortly to be announced will have the status of endorsement by the State Council of the People’s Republic of China and, although it has not been announced yet, I can share with you a few highlights in the development plan. One is the objective. What is the purpose of doing a bay area? It’s to strive to develop this bay area into a more dynamic economic region, a quality living circle which is an ideal place for living, working, travelling, and a showcase for in-depth co-operation between the Mainland, Hong Kong and Macau, and join hands in building a first-class bay area. So the aspirations for this bay area are very high. We are aiming at the international level to do our joint co-operation and the principles of co-operation are complementarity. We don’t want to compete directly amongst ourselves. Well, as a bay area we may wish to compete with other bay areas, both in the Mainland of China and all over the world. But within the bay area, we will try to work with each other to achieve what we call a win-win situation, and the key co-operation areas in the bay area will include infrastructure connectivity in order to achieve that living circle which is very convenient for people; market integration, whether it is in trade, in commerce, in financial services and investment; and also in technology and innovation. The second favourable condition is of course “One country, two systems”. We are not identical. This is a bay area which is unusual and unique because of “One country, two systems”. So, we have our own system and Macau has its own system under “One country, two systems”. As far as Hong Kong is concerned, we have the rule of law and the independence of judiciary. We are very strong in terms of being an international trade and financial centre and we are the world’s freest and most competitive economy. We provide quality professional services to other enterprises and we have very good universities that are involved in research and development in Hong Kong. And being an international financial centre and a free economy, there are absolutely no barriers in the flow of capital and information in Hong Kong. There has been some concern raised recently in some quarters: if you are talking about an integrated bay area, does that mean that this “One country, two systems” principle which is so very important will be eroded? The answer is no. This bay area prides itself on “One country, two systems”, and the most authoritative reply to that concern came from Premier Li Keqiang. Having finished the “two sessions” this year in Beijing, at a press conference for local and overseas journalists, Premier Li Keqiang, in response to an enquiry along the lines that I have just mentioned, he has this to say. He said that the Central Government encourages Hong Kong and Macau to integrate their own development into the overall national development. In this process, we will continue to observe the principle of “One country, two systems”, under which the people of Hong Kong administer Hong Kong, the people of Macau administer Macau, and both regions enjoy a high degree of autonomy. As there can be mutually beneficial co-operation and common development between different countries, there is even more reason for the three places which belong to one and the same country to do so. Under the guidance of “One country, two systems” principle, we are confident that these three areas will draw upon each other’s strengths and work together in building a new and strong region of vibrant growth. The third favourable condition is enhanced connectivity, because one of the objectives of this bay area is the free flow of people and goods. And we want to develop a living circle which is very convenient for the 68 million people in the bay area. So I’m very excited to share with you that we now have three major cross-boundary infrastructure projects that will be commissioned pretty soon, and a major French construction company actually is involved in some of these major infrastructure projects. Number one is the Hong Kong-Zhuhai-Macao Bridge, which will connect Hong Kong to the other two parts in the bay area – Macau and Zhuhai, which is one of the nine cities on the western part of Guangdong Province. We are going to open an Express Rail Link connecting Hong Kong in 48 minutes to Guangzhou and even shorter distance to Shenzhen, and from there to the rest of China with an extensive high-speed rail of close to 30,000km. And we are going to open an additional, which is the seventh, land-based control point between Hong Kong and the eastern part of Shenzhen. These particular control points are the busiest in the world, handling over 600,000 passenger trips every day, so you can imagine this frequency and flow of people between the two places. The fourth favourable condition is there is already very strong commitment from the three places – Hong Kong, Guangdong, Macau – to facilitate the flow of people, goods, capital and information in the bay area. Last November, the Guangdong Governor Mr Ma Xingrui and I had an annual meeting between Hong Kong and Guangdong and we already agreed that while waiting for the development plan to be announced, we could start working on some of the key areas within the bay area, building on our previous closer relationship on the CEPA, Closer Economic Partnership Arrangement, and this liberalisation of trade in services in Guangdong that has been put in place over the past decade. Of course, some of these facilitating measures could only come from the Central Government. So, in order to have more facilitating measures for people from Hong Kong and Macau to live and work and study in the bay area, we do need some Central Government supporting measures, and we have those measures made available to us in phases. In August and December last year when I was in Beijing, on both occasions the Central Government has announced some of the facilitating measures to make it easier for Hong Kong people to study, to work or even to buy flats in the bay area, and we are very grateful for that. And finally, there is this aspiration to build an international innovation and technology hub in the bay area on par with or even exceeding the Silicon Valley in the San Francisco Bay Area. And why do we have this aspiration? It’s because of the complementarity of the three places. Hong Kong has very strong R&D capacity because four of our universities are within the top 100 universities in the world and they are very strong in research. And Shenzhen has huge advanced manufacturing capacity and I would say that this is not only in Shenzhen. In other cities in the bay area, they are now building up very advanced manufacturing, electronic production capacity. So this formula of office in Hong Kong, R&D in Hong Kong, advanced manufacturing in the bay area cities and then if you need to scale up your business you come back to Hong Kong to use the financial services to seek listing and to raise capital or to issue bonds. It is a very attractive proposition which may not be readily available in other bay areas that I have mentioned. And we have a wonderful project which is a science park, a second science park based in Hong Kong, developed jointly with Shenzhen. We expect this 87 hectares of science park to be available in two to three years’ time. When I said that we have this aspiration, it’s not empty talk. We already have some of the measures put in place to attract more R&D institutions to Hong Kong, so my trip to Paris will involve some visits to the tech companies like Station F and also I went to visit Ecole Polytechnique yesterday in order to learn more about their research capacity. I would conclude by saying that there are exciting times ahead of us in this Guangdong-Hong Kong-Macao Bay Area and we welcome all of you – French companies, Chinese companies and Hong Kong companies – to join hands with us in growing this very important bay area, not only for Hong Kong, Macau, Guangdong, not only for China, but for the world. 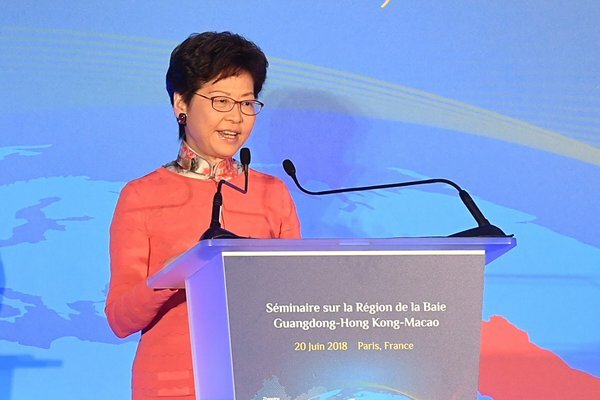 Chief Executive Carrie Lam gave these remarks at the joint promotion seminar on Guangdong-Hong Kong-Macao Bay Area development in Paris. I’m here this afternoon to speak about the promise of the Belt & Road Initiative, that far-reaching plan built on multilateral, multinational co-operation as well as multifaceted connectivity announced by President Xi Jinping in 2013. Five years by now, it has generally been recognised that the Belt & Road Initiative may well drive the global economy deep into the 21st century. Indeed, some 80 countries and international organisations across the three continents of Asia, Africa and Europe are committed to the Belt & Road. Today, more than 270 agreements or deliverables have been entered into among the economies along the Belt & Road corridors. These agreements and projects are transnational, complex in their goals and their needs. They range from finance, infrastructure and trade and commerce to information technology and digital development, as well as covering such sectors as agriculture, healthcare, environmental protection and conservation. For Hong Kong, the Belt & Road Initiative promises a wide-ranging window of opportunities. Hong Kong is destined to play an important role in this Initiative. Hence in December last year, we entered into an Arrangement with the National Development & Reform Commission of the People’s Republic of China on advancing Hong Kong’s full participation in and contribution to the initiative, which covers six key areas, and they are finance and investment, infrastructure and maritime services, economic and trade facilitation, people-to-people bonds, taking forward the Guangdong-Hong Kong-Macao Bay Area development, and enhancing collaboration in project interfacing and dispute resolution services. As part of the arrangement, we have set up a platform for regular and direct communication with relevant ministries of the Central Government and the inaugural meeting between the two sides actually took place in Beijing earlier this month. As a highly open economy, we embrace the free flow of capital, goods, talent and information, even as our economic ties with the Mainland continue to deepen. Both for the Mainland, and for the world at large, Hong Kong already serves as a critical intermediary and a multi-level bridge in managing and facilitating a ceaseless, mutually beneficial two-way flow. Powered by the Belt & Road Initiative, that flow will only expand and accelerate. This year is a very special year. It is the 40th anniversary of the reform and opening up of the Mainland of China and the world has witnessed with awe how this national strategy has brought economic and social benefits to the Chinese people and uplifted the global economy. Amidst emerging protectionism in some parts of the world, it is reassuring to hear President Xi Jinping speaking at the Boao Forum for Asia in April this year that the Mainland would substantially open up its services and financial sectors, creating a more attractive investment environment. Certainly, there will be broader use of the renminbi in global trade, investment and foreign reserves and, of course, in Belt & Road projects and their financing. That is music to my ears. It puts a spotlight on Hong Kong’s virtuoso ability to perform as a financial and services hub for the Belt & Road. With liquid capital flows and a deep pool of global financial talent, Hong Kong is the ideal centre in which to raise funds for infrastructure, investment and production projects, as well as to provide risk management, insurance and dispute resolution services to some of these projects. I know President Macron has noted that France is ready to play a leading role in the Belt & Road Initiative, and France is a founding member of the Asian Infrastructure Investment Bank, that is AIIB. Hong Kong looks forward to co-operating with French financial institutions to bridge any funding gaps in your Belt & Road projects. One area we are keen to target is green financing for the Belt & Road. We are, to be sure, already moving ahead in this growing area. Two years ago, our Mass Transit Railway Corporation took the lead, raising capital through the issuance of green bonds. Then, last November, the China Development Bank issued its first green bonds, which were listed on the Hong Kong Stock Exchange. To encourage more Belt & Road investors and issuers to participate in the Hong Kong bond market, my Government has announced a three-year Pilot Bond Grant Scheme earlier this year. A Hong Kong Special Administrative Region Government green bond issuance programme with a borrowing ceiling of $100 billion, that is almost 11 billion euros, is also in the pipeline. I am confident that green finance will add another dimension to our financial prowess and diversity. The Hong Kong Stock Exchange was the world’s number one in initial public offerings in five of the past nine years. Last year, funds raised through IPOs in Hong Kong totalled about 14 billion euros. We are the largest offshore renminbi business hub in the world, with a pool of RMB618 billion, which is over 80 billion euros, at the end of 2017. We handle about 76% of offshore renminbi transactions worldwide. Hong Kong is also a premier centre for asset and risk management. Indeed, our combined fund management business has tripled over the past decade. Funds sourced from overseas investors accounted for two-thirds of the total in 2016. That surely underlines our attractiveness as an international asset management centre. 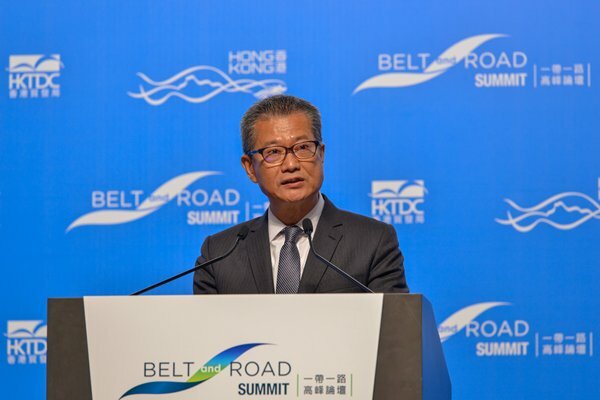 Since its inception in 2016, the Hong Kong Monetary Authority’s Infrastructure Financing Facilitation Office has brought together about 80 investment and financial players eager to pursue Belt & Road development. Knowing that a number of major French financial companies operate in Hong Kong, including BNP Paribas, Banking CIC, Credit Agricole and Bretteville Consulting, I welcome them and other French institutions to join the league. Infrastructure development is the engine that will drive the Belt & Road Initiative. The numbers certainly bear that out. According to the Asian Development Bank, it is estimated that Asia will require an infrastructure investment of 1.4 to 1.5 trillion Euro a year through 2030. Heavy investment is driving the construction of motorways, mass-transit transport systems and railways, renewable energy and power plants, gas pipelines, ports, water works, industrial parks and much more. Projects in the communications and IT sectors will also be a significant beneficiary. These projects demand international-level professional services. In this, Hong Kong welcomes the participation of French companies. The opportunities, all but boundless, include feasibility studies, environmental and social impact assessments, design, construction, project and contract management, accounting, operation and dispute resolution services. A number of French engineering and construction-related companies are very well established in Hong Kong – from the Bachy Soletanche Group and Dragages Hong Kong, to BYME Engineering, Freyssinet Hong Kong and Schneider Electric. I am sure they are ready partners in realising these Belt & Road opportunities. Those French companies operating in Hong Kong would agree with me that Hong Kong has a distinct advantage in legal services, given our trusted common law system buttressed by an independent judiciary. Local and international companies can be sure that disputes will be resolved in a fair and transparent manner. Indeed, arbitral awards made in Hong Kong are enforceable in more than 150 jurisdictions around the world, including the Mainland of China. The future is no less promising for trading and investment. Hong Kong’s free port status, and our standing as the world’s freest economy, is unshakeable. And that can only attract companies looking to tap Belt & Road opportunities. Hong Kong is the region’s trading hub and one of the best-connected cities in Asia. Half the world’s population is within five hours’ flying time from Hong Kong. Our Hong Kong International Airport is the world’s busiest airport for international cargo. Last year, it handled air cargo and airmail throughput of five million tonnes, maintaining the title of the worlds’ number one air cargo hub. And Government efforts are being made to strengthen that hub role. We are now transforming our airport into a three-runway system. The project includes reclamation of about 650 hectares of land, construction of a third runway and concourse, together with state-of-the-art people-moving and baggage-handling systems. On completion, it will have the capacity to handle 100 million passengers and nine million tonnes of cargo a year, ensuring that Hong Kong remains an Asian aviation power. Just last week, the Hong Kong Airport Authority announced the granting of the right to develop a major logistics centre at Hong Kong International Airport. The development on land connectivity is even more exciting. The flow of people and trade and opportunity between Hong Kong and the Mainland, particularly Guangdong Province, is set to soar, thanks to the opening later this year of two state-of-the-art infrastructure projects. I’m talking about the 42km Hong Kong-Zhuhai-Macao Bridge and the 26km Guangdong-Shenzhen-Hong Kong high-speed rail. Each, in its own right, will significantly reduce travelling time between Hong Kong and the Mainland. Together, they will help fast-track the Guangdong-Hong Kong-Macao Bay Area development. The bay area is another national development priority. It will knit together Hong Kong, Macau and nine prosperous Guangdong cities – an economy counting 68 million people and a collective GDP of 1.3 trillion euros, which is comparable to that of Australia. By taking collective advantage of the varying expertise each of the 11 cities can offer, the vision is to develop the bay area into a global technology and innovation hub, a modern system of different industries and a quality living circle for the people. Ultimately, this bay area will serve as a potent connection point for the Belt & Road Initiative, applying the formidable strengths and experience of Hong Kong and the other bay area cities to support the initiative and China’s national development. The Belt & Road will be nothing less than transformative. For the Mainland, for Hong Kong and for all those economies and companies that ride its outsized promise through this 21st century. You can learn more – and, no doubt, find eager partners and projects – if you or your representatives are going to attend our third Belt & Road Summit to be held next week in Hong Kong or future editions of this annual event. Jointly organised by the Government and the Hong Kong Trade Development Council, it has become not only a forum for updating and exchanges on this major Initiative, but also an effective platform for one-to-one business matching among project owners, investors and service providers. This year’s Summit is expected to draw close to 5,000 professionals from Hong Kong, the Mainland and all over the world. As President Xi said at the April Boao Forum for Asia: “The Belt & Road Initiative may be China’s idea, but its opportunities and outcomes are going to benefit the world.” I hope you will join us in grasping those opportunities and sharing the benefits. 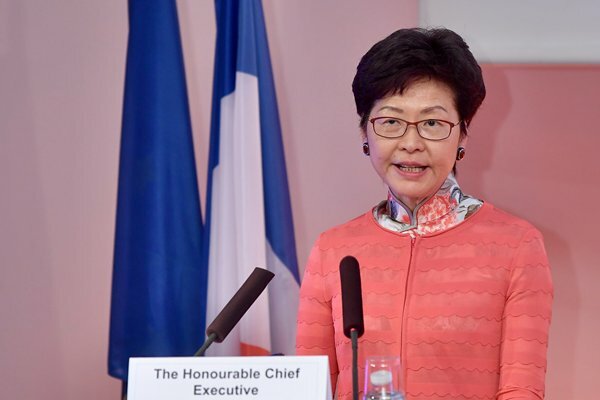 Chief Executive Carrie Lam gave this speech at the France-Hong Kong & Mainland China Economic Forum in Paris on June 20. Only with impressive design, meticulous construction technique, rigorous project management and robust teamwork can we turn a bare site into a signature building. That explains why the Quality Building Award was founded in 2001 when nine professional institutions decided to launch a biennial award to promote the collective commitment of the building industry to achieve the highest standards of teamwork, professionalism and competitiveness. This year is the ninth edition of the award ceremony. The theme of the 2018 award is “Driven by Profession • United for Success” which echoes well with the governance philosophy of the current-term Government. We are committed to working with the community to reinforce Hong Kong’s strength and propel the economy forward. To this end, we have adopted a new style of governance including adding the new roles of the Government as a “facilitator” and “promoter” in addition to the traditional functions of “regulator” and “service provider”. Also, we are striving to attract talents and professionals to join various statutory and advisory bodies and welcome young elites to recommend themselves to participate in relevant advisory bodies. We are committed to making this government more open, accessible, responsive and innovative. Quality buildings are essential ingredients for a growing and dynamic metropolis like Hong Kong. The annual overall construction expenditure in Hong Kong in the coming five years will reach $250 – $305 billion, reflecting continuous strong demand for construction services. However, we are facing a number of challenges that might undermine our capability to cater for such demand, notably shortage of labour and an aging workforce. According to the latest manpower forecast released by the Construction Industry Council in January 2018, the industry will face a shortfall of 5,000 to 10,000 skilled workers in labour-intensive trades. Moreover, the average age of our construction workforce is 46, with about 40% of the skilled workers already aged 55 or above. The overall labour force in Hong Kong will start to dwindle after 2022, making it even more difficult to recruit construction workers. Innovative technology has been transforming the building sector worldwide. Hong Kong should keep up with this global trend to sustain our competitiveness and address the manpower pressure on the sector. In fact, automating and mechanising repetitive construction processes can enhance productivity and safety. Besides, the use of advanced technologies would also uplift the professional image of the construction practitioners and help attract new blood. In her inaugural Policy Address, the Chief Executive has highlighted key measures to help the building sector improve productivity, built quality, environmental performance and site safety. For major government capital works projects scheduled to start this year, we have mandated the adoption of Building Information Modelling, or BIM, which allows visualisation of designs to enhance planning and co-ordination in the construction process, contributing to significant reduction in material wastage as well as pre-empting safety pitfalls and unworkable designs. To encourage building designers to make use of BIM when preparing building plan submissions, the Buildings Department has already issued a practice note for the industry while actively considering the possible next step to admit BIM e-submission in the future. We are also working closely with the building industry to enhance the innovation capability of existing practitioners and prospective building professionals for the continuous improvement of the sector. The Construction Industry Council has established the Construction Innovation & Technology Application Centre leading the industry to embrace innovation through collecting, exhibiting and experiencing the latest construction technologies, as well as to support their application by small and medium enterprises. The council will also formulate BIM technical standards, help equip the industry and encourage the use of such technology in private work projects. Off-site prefabrication for on-site assembly such as Modular Integration Construction, or MiC in short, can reduce manpower and time requirements and minimise the environmental nuisance arising from construction. MiC has been widely used in countries like the UK, Australia and Singapore. To take the lead, the Hong Kong Special Administrative Region Government is piloting the use of MiC in the development of Innocell located at the Hong Kong Science & Technology Park as well as a student hostel at the University of Hong Kong. 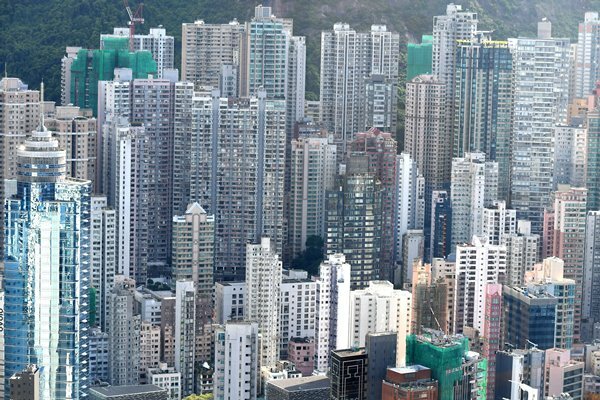 To facilitate wider use of MiC for private building developments in Hong Kong, the Buildings Department has set up a pre-acceptance mechanism for granting in-principle acceptance to MiC systems or components, and issued a practice note to facilitate submission preparation. To boost the technological capacities of enterprises and practitioners in the building industry, this year’s Budget proposed to establish a $1 billion Construction Innovation & Technology Fund to provide financial support for the industry to acquire both software and hardware and to nurture the expertise required for using local and overseas innovative construction technologies such as BIM, steel reinforcing bar products produced in local prefabrication yards and MiC when carrying out development projects. The fund will also support students and practitioners of the building industry to receive training on innovative technologies such as courses offered by Massachusetts Institute of Technology, ETH Zurich, the Technical University of Munich and Tsinghua University. While we celebrate distinguished buildings tonight, we must not lose sight of the quality of our existing building stock. There are over 5,000 private buildings aged 50 or above. Many of them lack proper management given the absence of owners’ committee or property management agency. These buildings, if left unattended, will pose serious threat to the safety of our citizens. To encourage proper and timely maintenance and repairs to enhance building safety, extend the useful life of buildings, slow down urban decay and improve the living conditions of the community, we will soon launch the $3 billion “Operation Building Bright 2.0” to provide financial and technical assistance to owners or occupiers of buildings aged more than 50 years. In addition, a $2 billion Fire Safety Improvement Works Subsidy Scheme will also be introduced to subsidise owners of old composite buildings to undertake fire safety enhancement measures. A do-it-yourself tool-kit offering practical guidance to owners in undertaking building repair and maintenance works will be provided to participating buildings. The Urban Renewal Authority will also deploy designated staff to follow up on tendering matters and closely liaise with the owners’ corporations to help owners to take forward the repair works. Hong Kong is renowned for its beautiful skyscraper landscape created by the joint effort and admirable craftsmanship of our building sector over the years. The Quality Building Award further raises the benchmark and widens the quality spectrum for excellent construction projects in Hong Kong and beyond. Acting Chief Executive Matthew Cheung gave this speech at the Quality Building Award 2018 Presentation Ceremony on June 15. The green bond market has come a long good way in just over a decade. It debuted only in 2007, with the issuance of a “climate awareness bond” by the European Investment Bank. The 2015 Paris Agreement, adopted by 195 countries, has taken it to another level, lending it both heightened urgency and broad credibility across the full spectrum of governments, financial institutions and public and private entities. In September 2016, green finance was for the first time included on the agenda of the G20 Summit held in Hangzhou, China. The importance of green finance was rightly recognised by the G20 leaders in the communique of the summit. Last year, the global green bond issuance was around US$160 billion, 80% more than the previous year. And China, the leading advocate of green finance at G20, issued more than US$23 billion worth of green bonds last year. Today, sovereign issuance accounts for about one-third of the total in both developed and emerging markets. I am glad to report that Hong Kong will soon join the green wave, by issuing government green bonds with a borrowing ceiling of about US$13 billion. We will, let me assure you, do so under the best market practices, and we will encourage others to arrange financing for their green projects through our premier capital platform. The sheer scale of capital required to meet the global, low-carbon challenge demands an international alignment of interests, incentives as well as practices, and of course, public-private collaboration. It helps, enormously, that the Green Bond Principles, with their focus on transparency, disclosure and reporting, are creating a level playing field for investors and issuers. Building on this foundation, many national and regional authorities governing green bond issuance are developing practices that respond to their local circumstances. That includes Hong Kong. We are tapping our local expertise to get a head start on green finance certification. I must say I am encouraged by the favourable market response to our first local Green Finance Certification Scheme, which was launched in January this year. The scheme reflects a number of widely recognised international standards, including of course the Green Bond Principles, awarding pre-issuance and post-issuance stage certificates to green-debt instruments. And we will set up a Green Bond Grant Scheme to subsidise the costs issuers incur in using our Green Finance Certification Scheme. Another financial incentive, the Pilot Bond Grant Scheme, offers a grant equivalent to half the expenses incurred in each eligible bond issuance. I’m sure you’ll hear more about this from the Monetary Authority today. And let me add that the Asian Development Bank, the World Bank and the European Investment Bank, among other international organisations, have issued green bonds here in Hong Kong. That gives us a bit of a head start. More importantly, our financial services sector has long earned the trust – and the capital – of the international institutions and major corporations. We aim to build our reputation in the Guangdong-Hong Kong-Macao Bay Area, as well as the expanding economies under the Belt & Road Initiative. I am confident that Hong Kong will, soon enough, be well known for green finance as we are now counted on for capital formation prowess, our offshore renminbi products, and our many attractions as a global centre for IPOs (initial public offerings). 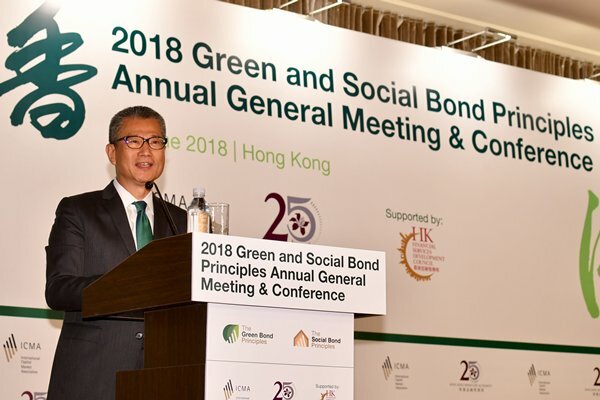 Financial Secretary Paul Chan gave these remarks at the 2018 Green & Social Bond Principles Annual General Meeting & Conference. Today is the 18th anniversary and this number 18, I’m sure you’ll agree, is a very good figure. It will bring good fortune to Hong Kong and to the future of Hong Kong Exchanges & Clearing Limited and the market. Also 18 is a moment you enter adulthood. I’m not suggesting that HKEX was kind of childish in the last 17 years, but this is a moment for us to enter a new era of adulthood. So, if in the past we have benefited significantly from the opening up and reform of the Mainland of China’s financial markets, this is a time for Hong Kong to go global. A few days after I took office, I was standing here to witness the launching of the Bond Connect, and we have to be extremely grateful to the Central Authorities for giving us so many opportunities in the last few years, one after another with the Shanghai Connect, the mutual recognition of funds, the Shenzhen Connect and then last year’s Bond Connect. But Hong Kong’s value lies in being international, and this is where we could contribute to the further opening up of the Mainland’s financial markets. So I have this joint mission and aspiration that we should really take our markets globally and attract more internationally renowned companies to come to list on HKEX. I already put in my little part by going on a 12-hour trip to Saudi Arabia last December, Riyadh, for only one single objective – you know what that is, and we’re still working very hard at that. I’m happy to go on more roadshows, if my diary permits, with the HKEX in order to tell the world that this is the place to be, because attracting overseas companies to list in Hong Kong is not just a question of listing rules – although listing rules are very important as we have seen from the new listing rules to attract new-economy technology companies, biotechnology companies and secondary listing of overseas-listed companies in Hong Kong. But it is not just the listing rules. I would say that it is not just the regulatory regime of Carlson (Tong, Securities & Futures Commission Chairman) and Ashley (Alder, SFC Chief Executive Officer). It is also what Hong Kong can offer. So, it is for me as the Chief Executive, the Financial Secretary and our team to back up your promotion work to tell people what this city can offer. We can offer the rule of law, the independence of the Judiciary, this high degree of internationalisation and this place being a very liveable city, so that more companies from abroad will choose Hong Kong as their destination for the raising of capital. I hope that in my tenure I will continue to make my contribution to Hong Kong’s securities industry, and I hope that you will all support the team and my Government in bringing Hong Kong’s securities market to new heights. 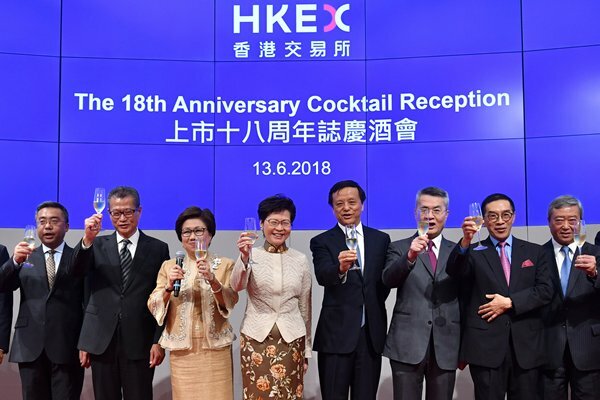 Chief Executive Carrie Lam gave these remarks at the 18th Anniversary of the Hong Kong Exchanges & Clearing Limited Cocktail Reception on June 13.